Feel free to call, email or visit our store in South Paris, Maine. Tuesday through Saturday 9am to 5pm. Closed Sunday and Monday. Turn right onto ME-117 / ME-26 / Main St. and arrive at 145 Main St.
Start out going North on Main St. toward Broad St. Turn left onto Broad St. Turn right onto Main St.
Start out going East on US-302 / 10th Mountain Division Hwy / Main toward Walker St. Turn left onto Harrison Rd. / ME-117. Continue to follow ME-117 for 5 miles. Turn slight left onto ME-117 / Norway Rd. Continue to follow ME-117 for 12 miles. Turn slight left onto Paris St. / ME-117 / ME-26. Continue to follow ME-117 / ME-26. End at 145 Main St.
Start out going Northeast on US-202 / ME-4 / W Gray Rd. toward ME-100 / ME-26 / Portland Rd. Continue to follow US-202. Turn left onto Shaker Rd. / ME-26. Continue to follow ME-26 for 26 miles. Turn right onto Paris St. / ME-117 / ME-26. Continue to follow ME-117 / ME-26. Start out going East on Court St. toward ME-4 S / Union St. Byp S.
Turn right onto US-202 W / Minot Ave S / ME-100 S. Continue to follow US-202 W / ME-100 S for 1 mile. US-202 W / ME-100 S becomes ME-121 S for 13 miles. Stay straight to go onto Main St. / ME-26 for 6 miles. 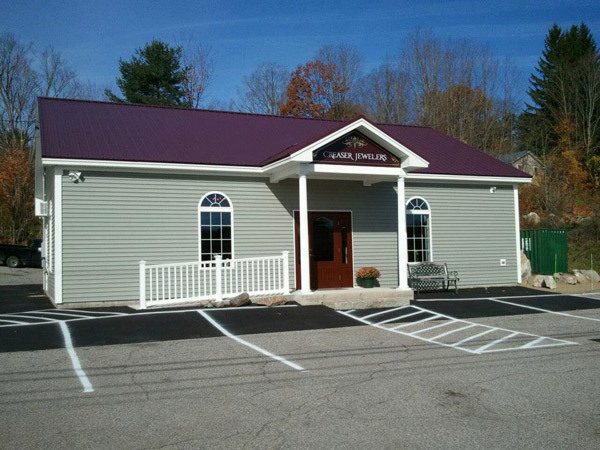 Our custom jewelry store in South Paris, Maine is a local favorite due to our outstanding service, quality and selection. We offer only the finest gemstone jewelry set in yellow gold, white gold and sterling silver, along with one-of-a-kind custom designed jewelry, rare mineral specimens, popular Maine gemstones, exotic gemstones, estate jewelry, and more.